I’ll tell you what’s been missing from your life: an Italian historical fantasy set in 13th-century Florence about longstanding family feuds and the spirits that guide them. That’s right. 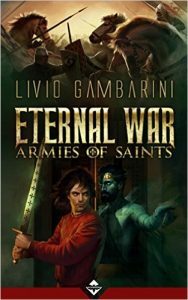 Eternal War: Armies of Saints weaves together Italian history, Christian figures, poetry (Dante makes an appearance), and deft humor to create a fast-paced, witty story about a feud and the accompanying shadow war that’s fought in the spirit world. At the heart of the story is Kabal, an “ancestrarch” in charge of the Cavalcanti family. As part of the Guelph faction, the Cavalcantis frequently fight against the Ghibellines, but recently things have been going badly. Routed at the battle of Montaperti, the Guelphs lose a lot of influence in Florence, and Kabal must find a way to restore the Cavalcanti fortunes and thus Guelph dominance. He ultimately guides Guido Cavalcanti- a poet and soldier- in the process of marrying the daughter of a rival family and forging a lasting peace. What makes Eternal War so accessible is Gambarini’s casual and witty style. Each family has its own ancestrarch, and in the spirit world, they argue and complain and insult one another in much the same way as “their humans” in the material world. Even Saint Peter, who is rousted from his very heavy slumber of centuries by the worried Guelphs, cracks jokes and drives the ancestrarchs crazy with vague promises and an irritable demeanor. At times, the spirits seem more corporeal than their humans, perhaps because the former are holding the strings. I’ve never read anything quite like Eternal War before, and I’m looking forward to checking out more of what Gambarini’s putting on paper (or e-ink).